Since Summer is not-quite-officially over and Fall is not-quite-officially here and my apartment is still hot but not hotter than hell, I searched around the internet for a good in-between-seasons recipe to make yesterday. Also, I wanted something that easy to put together since I had some errands to run and a few other things to get done last night (like watching the US Open). 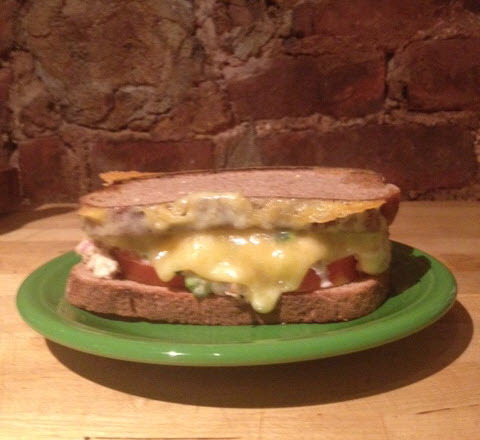 I was browsing Leite’s Culinaria – one of my favorite places to find recipes these days – and I found this recipe for a Fancy Tuna Melt from Clodagh McKenna. Tuna salad always reminds me of Summer and, to me, there’s nothing more comforting and Fall-ish than a grilled cheese. So, this seemed perfect. This sandwich totally hit the spot. It was quick and delicious. And I have leftovers that I can’t wait to eat tonight. 4. Place the sandwiches on a baking sheet and bake for 5 to 7 minutes, until the sandwich is warmed through and the cheese begins to melt. Alternatively, you can warm the sandwich in a griddle or sandwich maker. 5. Serve the sandwiches immediately.